This summer Mars and Saturn have been in opposition. This means Mars and Saturn are in a line, opposite Earth, in relation to the Sun. During opposition planets are closest to Earth and they are fully lit by the Sun, just like a full moon. During opposition astronomers are able to observe planets in greater detail. Recently the Hubble Space Telescope captured some spectacular images of these two planets. 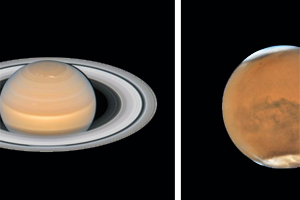 Hubble observed Saturn in June and Mars in July. Hubble’s high resolution images of these planets and their moons can only be exceeded by spacecraft. No other telescope can currently outperform Hubble in regard to observing planets and moons in our solar system. Taken by the Hubble Space Telescope on June 6th, 2018. This picture shows Saturn with six of its 62 known moons. During Saturn’s recent opposition, it was approximately 1.4 billion kilometers (870 million miles) from Earth. Hubble managed to capture Saturn’s wonderful system of rings when it was at maximum tilt in relation to Earth. This allowed Hubble to capture magnificent images of Saturn’s rings and the gaps between them. These new images by Hubble also managed to capture the hexagonal storm in Saturn’s north pole. First observed by Voyager 1 in November of 1980, the storm has perplexed astronomers since its discovery. Taken by the Hubble Space Telescope on July 18th, 2018. Hubble’s new photos of Mars were taken on July 18th, 2018. This year Mars was only 57.6 million kilometers (35.8 million miles) from Earth during its closest approach. This is the closest Mars has been to Earth since 2003. Mars and Earth are in opposition every 2 years. Mars is currently undergoing a planet-wide sandstorm and Hubble was able to capture images of it. Many planetary features of Mars are currently obscured by the ongoing sandstorm. The storm has been raging since May, 2018. It took only 3 weeks to develop into a planet-wide sandstorm. Sandstorms are common on Mars. They happen every year, but are usually confined to a local area and last 2-3 weeks. Large storms can continue to grow and encompass the entire planet. Planet-wide storms are a rare event. They last for weeks or months and tend to happen during the spring and summer months of Mars’s southern hemisphere (when Mars is closest to the Sun in its orbit). During these months there are higher temperatures, which allow dust particles to be lifted higher into the atmosphere. This in turn creates more wind, which in turn strengthens the sandstorm. It is a feedback loop that astronomers are still trying to fully understand. This image of Mars shows features of the planet that were visible in the summer of 2018 despite the planet-wide sandstorm. Astronomers can compare these new images of Mars with older ones and in turn better understand Mars and its weather patterns. After almost 30 years in operation, the Hubble Space Telescope continues to deliver spectacular and outstanding astronomical photos.